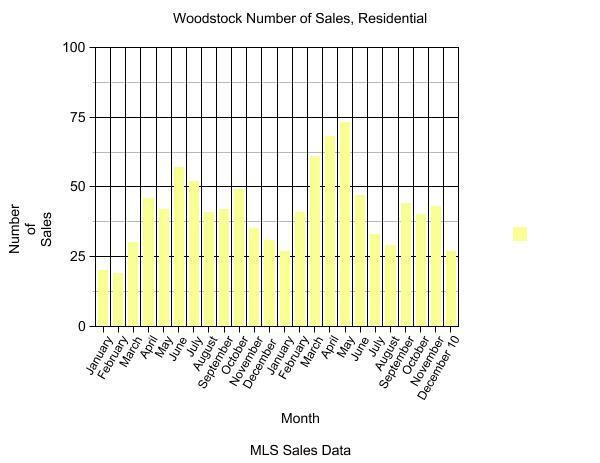 2010 was a very interesting year in Real Estate Sales in the Woodstock and District Real Estate Board. The average sale price in 2010 was $218,216, up 3.44% from an average 2009 sale price of $210,957. For reference, 2008's average sale price was $215,202, and 2007 was $210,510. 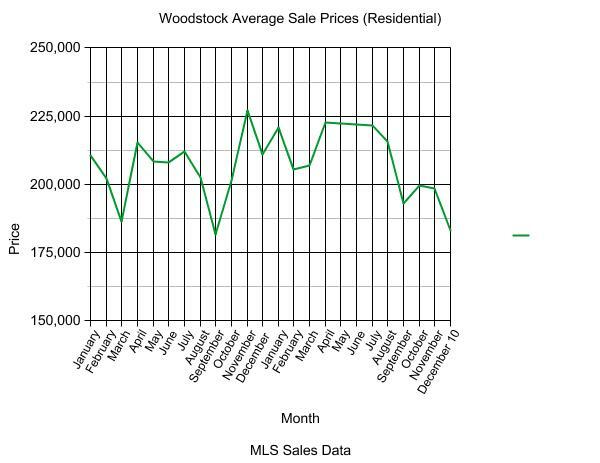 Here you can view a Line graph of Historic Sales Values in Woodstock for the 2009 and 2010 Calendar year, as well as a bar graph illustrating the number of Residential homes sold in Woodstock for the same period. It is interesting to note the trend - As predicted by myself and many in the sector at the conclusion of 2009, due to low interest rates and deferred purchasing, the first half of the year would be a busy time, with prices being pushed higher by steady supply and increased demand. Take a look at what happened to average sale prices after July, 2010. The impact of the HST had a large psychological effect on the buyers in the marketplace. Additional factors that caused the decrease in sales volume and subsequently in the average sales price (by tipping the supply and demand scale) include the threat of rising interest rates ("buy now before the rates go up! ), and tighter lending requirements. Going forward into 2011, I am confident that we will see very much a repeat of 2010 in terms of overall volume and average sales prices. We've seen a pretty stagnant growth pattern year over year since 2007, and next year should look somewhat the same. I expect slightly fewer number of sales year over year from 2010, and average sale prices to remain strong, but not growing much past the $220,000 mark. It is expected by many industry analysts that we will have a very strong first half of 2011, followed by a stagnation in the latter parts of this year. In other words, the graph should look strikingly similar. Though we do not have any major factors on the horizon that might influence the market (such as the HST introduction), we do have several smaller factors influencing market strength. The ongoing threat of higher interest rates has been somewhat subdued by latent recoveries in the domestic and American markets, but the recovery is gathering steam. This means that EVENTUALLY interest rates will start to climb, and when they do, this is bound to have a negative impact on housing values. It's been said that rates may begin to climb at the conclusion of spring 2011. Well, if you're thinking it's time to sell, the time to act is NOW. Catch the wave that is likely to crest in March or April if you're looking for the best value in 2011. If you're buying, suppressed demand in the market means you will have time to act, but shorter supply trends indicate that prices are likely to increase throughout the year. Be aware of interest rate trends, and make sure you get a RATE GUARANTEE if you are planning to buy. If rates go up, you will be able to purchase less house for similar cost, so it makes sense to act soon. If you have questions about this post, or Real Estate in general, feel free to email me here. I wish you all a safe and prosperous 2011. I'm here, and ready to help!